UPDATE: WATCH THE EXTENDED GOTHAM TRAILER BELOW! It’s official! 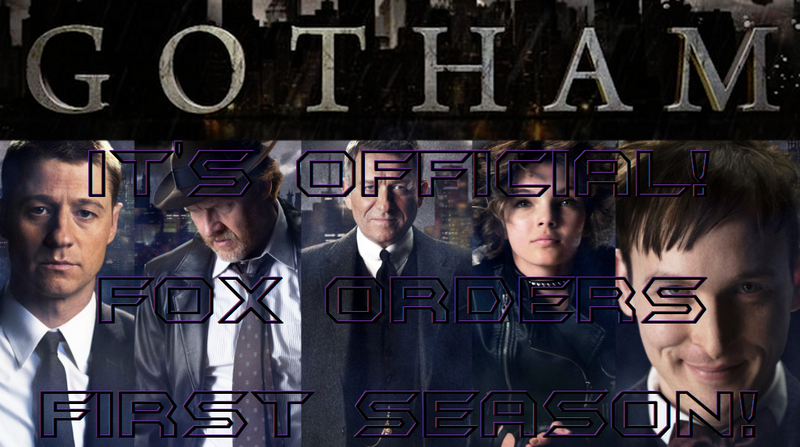 Fox has ordered a first season of Gotham! We’re not surprised, but we are excited! Gotham tells the story of a young James (Commissioner) Gordon during his time as a detective for the Gotham City Police Department. First trailer debuts tonight during 24! Ben McKenzie will front the series as Detective James Gordon, and he’ll be joined by Donal Logue as Detective Harvey Bullock, Jada Pinkett Smith as crime boss Fish Mooney, David Mazouz as Young Bruce Wayne, Sean Pertwee as Wayne family servent Alfred Pennyworth, Robin Lord Taylor as Oswald Cobblepot (a.k.a. The Penguin), Camren Bicondova as Selina Kyle (a.k.a. Catwoman), Erin Richards as Gordon’s fiancée Barbara Kean, Zabryna Guevara as Gotham PD Captain Essen and guest star Cory Michael Smith as Edward Nygma (a.k.a. The Riddler). Gotham stars Ben McKenzie as Detective James Gordon; and also features Donal Logue as Detective Harvey Bullock, David Mazouz as a young Bruce Wayne, Sean Pertwee as Alfred Pennyworth, Jada Pinkett Smith as crime boss Fish Mooney, Robin Lord Taylor as Oswald Cobblepot (Penguin), Camren Bicondova as Selina Kyle (Catwoman), Erin Richards as Barbara Kean (Gordon’s fiancé), Zabryna Guevara as Gotham PD Captain Essen, and Cory Michael Smith as Edward Nygma (Riddler). got a nerdy mind? Write about it! Is there something you’d like to write for us or read from us? Take a look around to make sure we haven’t done it already, and let us know! Keep up with all our new stuff by following @NerdyMindsMag on Twitter and liking Nerdy Minds Magazine on Facebook. Golden Week Gives You PlayStation Games at Half Price (or less! )…and It’s Almost Over! Why We’re Excited for MARVEL’S AGENT CARTER (TV Series)!